Polished hardware heightens the signature style of this saddle-inspired crossbody from See by Chloe. Also available in Skylight, Powder Pink,Caramel, Black, Beige, Ultramarine, Pineapple, Tan, and Green. 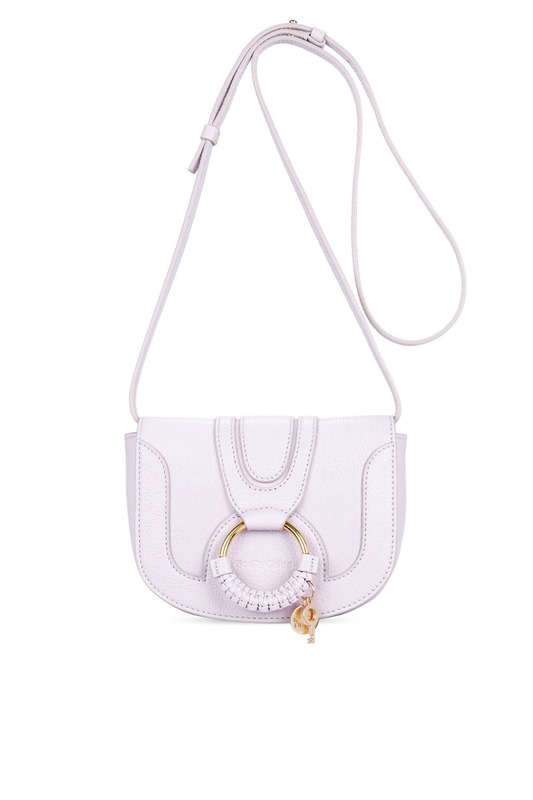 Lilac pebbled leather crossbody bag with front metal ring, key, and logo accents. Front flap with magnetic button closure. Dual interior compartments and slip pocket. Adjustable shoulder strap. 7" W x 5.5" H x 2" D.
This bag is very small so unless you have just a small coin or credit card holder it won't fit a wallet. It fit some lip balm, credit cards and surprisingly my big iPhone. The style is cute and was fun and easy for travel. 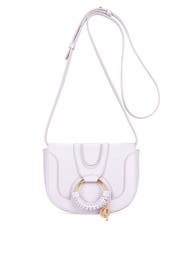 A darling little bag...but too small for a phone, wallet, and sunglasses case. I should have read the description, as the bag was much smaller than anticipated. the color is also a light purple. from the photo, it looks beige. Used it about 3 times, it was a little smaller than i thought but fit my phone, credit cards, and lipstick perfectly. Cutest color and small size! This was the cutest pastel for winter and the size was just what I needed to head out and about. Perfect size for the small essentials you always need. I used it every day vacationing in Hawaii and got many compliments.